As part of their series of Disney concerts, the Hollywood Bowl is putting on a special live performance of The Little Mermaid on May 17 and 18. The film will play in the background, but the songs will be performed by actors on the stage. Sounds like an amazing, two night only experience, right? It looks like Lindsay Lohan might feel the same way — only it won’t be her experiencing it. Harvey Fierstein will play Ursula, Cheech Marin will play Chef Louis, Peter Gallagher will play King Triton, Leo Gallo will play Prince Eric, and Ken Page will play Sebastian. The titular role of Ariel will be sung by… Lea Michele. Ariel who? I don’t know her. So is Lindsay shading Lea? Why would she do that?? 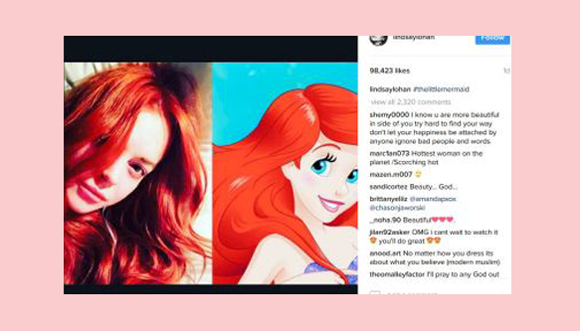 Well, you have to rewind a sec and remember Lindsay Lohan LOVES The Little Mermaid. Oh. Oh no, honey. There is no production which is going to cast both Lindsay and Meryl Streep. Except maybe that new Cats movie. That cast list is CRAY. Of course, she did say it was a dream. All sorts of weird things can happen in dreams. Talking silverware, flying horses. Lindsay’s last acting role was in a direct to Red Box film called Among The Shadows. The logline? Look, just being brutally honest here, y’all. Lindsay isn’t a Broadway quality singer, which is what this role requires. And if we’re talking about the eventual live action movie, she isn’t even a Disney quality actress anymore. We sincerely hope for a Lohannaissance one day, but as long as Lindsay is keeping her drama at the reality TV level (Lindsay Lohan’s Beach Club at 10/9 central on MTV) instead of taking acting seriously, it isn’t going to happen. OK, so we have to ask, Perezcious readers — are we being totally unfair here? Is Lindsay not even throwing shade at the casting in the first place? Tell us what YOU think (below)!